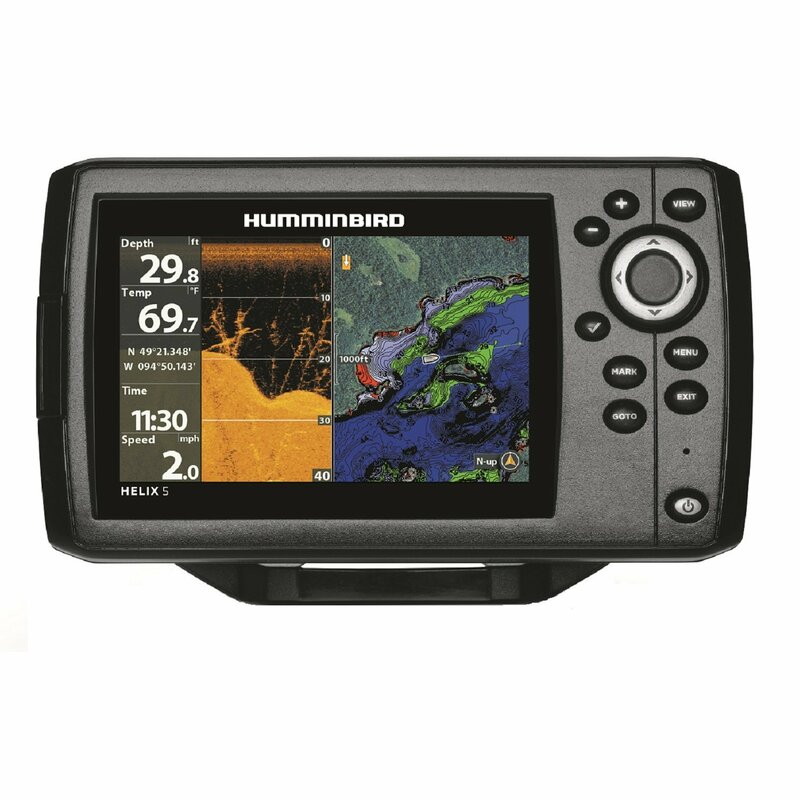 Humminbird Helix 5 SI GPS has an average rating of 3.25 out of 5 based on 8 user reviews. In November Humminbird introduced a new series of fishfinders – Helix 5. The units feature a brilliant, extra-wide, 480 x 800 resolution display that depicts 256-colors on a 5-inch screen complete with backlighting that ensures clear, crisp images in all types of lighting conditions day and night. The new display is essentially the main innovation in the Helix series, the transducers and the software are borrowed from the predecessors – 800 and 600 series. The familiar, large digits that provide water temperature, depth and vessel speed take up a lot of the display real estate. There there several different versions in the Helix 5 series ranging from the sonar-only unit to the side-imager with GPS. Helix 5 SI GPS is essentially a scaled down version of the 7 inch 899 model. The main difference is the size of the display. The internal GPS seems to be slightly improved and it provides more accurate position readings compared to the older models. In addition to chart-plotting, the unit comes preloaded with UniMap cartography and a micro SD slot for additional map software or for the option of saving waypoints. The UniMap provides 3D charts for inland lakes, rivers and the contiguous U.S. coastline. Charts are displayed in detailed, color topography. The unit itself has storage capacity for up to 2,500 waypoints or 45 specific routes. The Helix 5 GPS is also compatible with AutoChart, AutoChart Pro, HotMap, LakeMaster and Navionics Gold. Helix 5 requires 10 to 20 volts DC. The unit turns this juice into an average of 500 watts of sonar power with peak-to-peak output of 4,000 watts. The 2D sonar penetrates as far as 1,500 feet down by sending out a 200 kHz sonar wave in a 20 degree cone shape. Using this narrow beam, the width of the image will be just one-third the depth being reached. For example, an image showing the terrain at a 24 feet depth will only cover eight feet. The unit also allows 2D sonar with an 83 kHz beam that encompasses 60 degrees. This mode permits an image that’s as wide as it is deep. The trade-off is that it creates a lower-resolution view. It’s possible to run both frequencies simultaneously for better results. Additionally, the Quadrabeam Plus feature offers a full 90-degree area of coverage. Helix 5 also provides down imaging and side imaging high frequency sonar. Using side image, it provides a side-to-side, 180-degree perspective of the sub-aquatic terrain up to 480 feet in width on either side of the boat at the maximum depth of 100 feet. This is accomplished with dual sonar pulses operating at 455 kHz. The adjustable SwitchFire Sonar comes with Clear and Max Modes. Use Clear when searching for bait, school and game fish. Clear mode produces clearer images while filtering weaker signals, debris and silt disturbances. Max mode works for seeing bait and game fish, zoo plank populations, natural and man-made structures and thermoclines. Using this feature, anglers also have the chance to view jig action onscreen. Switchfire also provides color-coding to show which objects are closest to the boat. For instance, near-by items would appear orange while distant items would be colored blue. This feature has the option of changing the color scheme to fit different situations like nighttime or overcast days. The Helix 5 overall measures 7.55″W x 6.64″H x 3.3″D. The transducer has the standard 200/83/455 kHz frequencies. Head unit mounting options include in-dash or gimbal mount. User-friendly buttons on the face of the unit provide up/down, right/left viewing, zoom-in and zoom-out functions, goto, mark, menu and exit options. The unit comes with a power cord, the mounting bracket, a transom mount transducer and the owner’s manual. You can get a great deal on Humminbird Helix 5 SI GPS here. This unit is a great value for the money. It’s got a true high resolution screen, much better than the competition. It hold the bottom very well even at high speeds. The GPS speed is also very accurate. On top of that you get both side imaging and down imaging. The preloaded maps are just basic surface maps, you will have to get a Lakemaster or Navionics card if you need bottom contours. This unit has side imaging and down imaging but to me the best part of it is the regular sonar. The target separation and accuracy is awesome when compared to my old Lowrance Elite 5. This unit is great when it comes to finding fish and I highly recommend it. Just bought the helix 5 si gps…have had it on 2 ponds max depth 19 ft, have had fish alarm go off only once, have it set on Humminbirds recommendations, shows btm structure fine but no fish, wondering if sonar scares them in that depth? I have to sit pretty close to the unit to read it, it needs a hood to cut the glare down, or just make your own like I did. Printed off the manual, 170 pages…so far the unit has done everything it says except for the fish id issue. The unit itself works great. The biggest downfall is lack of mapping software for Western Canada. Side and Down imaging is nice but menus and screens are inadequate and not easy to use compared to my Garmins. My biggest gripe is GPS accuracy is off, like about 3 mi.s to the east. It also lacks a “numbers” display page which can be programmed with all the data I want to see. It merely has a data sidebar with a scant amount of inputs. Although the fish alarm is enabled I have yet to hear it go off even when catching grouper and King Mackerel! IMO it’s another product made in a test lab by engineers for use in a test lab by engineers. The menus and displays clearly show no understanding or appreciation of boating and fishing usage requirements. Not intuitive at all. I’ve had my Helix 5 SI for almost exactly a year now. I got it and the Lakemaster maps at the same time. For the most part the unit itself works ok. The gps is great for finding your way on strange water or in the dark, not so much for fine tuning your fishing spot, as it will get you within 50′ or so, but not much better. As a regular sonar unit it is excellent, and the down imaging is pretty good, but the side imaging is pretty worthless, in my experience. Save your money and just get the “DI” version. The Lakemaster maps are ok, but don’t expect any better map than you will get from, say, the state park office or the local Chamber of Commerce. They are not capable of being upgraded. If I had it to do over I would have gotten Navionics instead, which does upgrade and have some other nifty features. I have been very happy with the unit. Shows structure well and fish alarm is great. My major concern is it shuts off when traveling in choppy water. I called customer service and talked with someone who knew nothing. I have been told the connection where the wires attach to the unit are not secure. Just a malfunction with the helix 5 unit. This is very annoying. Got a helix 5SI unit got heavy rain while driving to lake.Needless to say seal not good on this one filled mine full of water.I am going be out around 100 dollars for repairs.I am switching to lowrance besides that everything worked fine.But who can afford to pay for unit and then 100 dollars ever year and half to have it fixed.